The Full Belly Project most recently demonstrated the Pedal Powered Agricultural Center (PPAC) and the Universal Nut Sheller, (UNS) at the Popular Mechanics Breakthrough Awards ceremony where Jock Brandis, the inventor was honored for the development of these labor saving devices and for their potential to positively change the world. 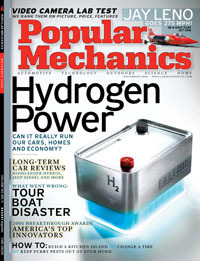 See our article in the November issue of Popular Mechanics! Don’t miss the upcoming documentary Peanuts on Link TV. When film technician Jock Brandis discovered cotton being grown in traditionally food-bearing fields in a village in southern Mali, he decided to take action. He began developing a peanut-husking machine that would enable villagers to grow and harvest peanuts in place of cotton. PEANUTS follows Jock and his set of fiberglass molds back to Mali, where he works with local villagers to perfect and manufacture the hand-operated peanut husker – the Malian Peanut/Groundnut Sheller. As word spreads about the invention, there are plans for thousands of the machines to be manufactured and used not only in Mali, but across the globe. PEANUTS shows a living example of the difference that one person, with good will and determination, can make in the lives of countless others. Every so often, the Nobel Peace Prize is awarded to an organization rather than to an individual. This was the case in 1999, when Medecins Sans Frontieres (Doctors Without Borders) received the esteemed Laureate. Furthermore, the International Red Cross has received the Peace Prize for its humanitarian efforts three times — in 1917, 1944 and again in 1963. Given these precedents, it’s conceivable that a community, like our own fair City of Wilmington, could aspire to the honor. Such is the dream described by Jock Brandis at the Full Belly Project’s annual Adopt a Village International Music Fest and Auction held March 19 at St. Mark’s Church Activity Center. In unveiling his dream, Brandis effectively issued a challenge to us Wilmingtonians — that we embrace the Full Belly Project’s mission on a scale so large as to bring about significant, positive change in the world. The project’s sole goal is the widespread distribution of peanut shellers (or the molds and parts to make them) to impoverished areas around the globe. Brandis invented the sheller after a trip to Africa in the summer of 2000. While visiting a Peace Corps volunteer working in Southern Mali to increase protein in children’s diets, Brandis became acquainted with a dilemma common to the people of many Third World countries. Peanuts and other nuts could become a more reliable and plentiful source of protein for millions of people if only they possessed a more efficient way to shell them than by hand. Drying peanuts in the sun, which is necessary to conserve fuel, renders the shells hard and difficult to open by hand. This work is performed primarily by women, and the process consumes an inordinate amount of their time. Therefore, Brandis decided when he returned to the States, he would buy and ship a shelling machine to the village. Unbeknownst to him, no such device existed that was appropriate for use in a poor and primitive country. What these villagers and millions more like them needed was a simple, hand-operated machine made of common, inexpensive materials. Finding no nut sheller filling this criteria, Brandis, a former engineer, decided to invent one. His nut sheller is made from concrete and a few primitive metal parts, totalling $50 worth of materials. It has the capability of shelling 50 kilograms of peanuts per hour, and one machine can serve the needs of a village of 2,000. Its life expectancy is 25 years. Brandis chose not to patent his invention — it is his gift to those in need. Engineering drawings with dimensions as well as instructions are posted on the Web site www.peanutsheller.com. Both non-profit and commercial groups are welcome to make use of any information provided on the Web site. The fiberglass molds for fashioning the concrete elements can be shipped to destinations where this technology is not available. The Coastal Carolinas Returned Peace Corps Volunteers, of which Brandis is a member, was instrumental in forming the non-profit Full Belly Project. Jay Tervo, the current president of Full Belly, recently travelled to Uganda on a two-week junket to promote the project. Accompanying him was filmmaker Rex Miller, who documented their trip. While there, they delivered metal parts and molds to set up several peanut shellers. Equally important, they met with members of the Peace Corps, Catholic Relief Services, Feed the Children and others capable of propagating use of the shellers. Tervo, a member of the Wilmington West Rotary Club, also managed to get on the agenda of a Ugandan Rotary meeting, where he challenged all the Rotary clubs in that country to raise $500 each for shellers. Similarly, Tervo plans to ask local Rotary clubs to band together and match every $500 raised by Ugandan clubs with $1,000. More than 133 adults and about a dozen children attended the March 19 benefit, which raised nearly $10,000 from ticket sales, auctions, and other donations. Sponsorships of two villages were auctioned — Doug Clark was the highest bidder for Namusaale, and Carlos Largomarsino won the bid for the refugee camp Bobi — resulting in peanut shellers being given to both communities. Event organizers, attendees, those who donated items for auction, members of Coastal Carolina Returned Peace Corps, the board of the Full Belly Project — and of course Jock Brandis — are all to be commended. Hopefully their efforts to make these life-changing machines available where they are desperately needed will inspire many more individuals, as well as civic clubs and businesses, to get involved. If so, Wilmington just might become the first city to earn the Nobel Peace Prize. More importantly, we will have taken a huge bite out of Third-World hunger.